On a blistering morning in July 2017, Ghazi Luaibi rose before dawn and set out in a worn black sedan from his home in Zubair, a town of concrete low-rises in southern Iraq. He drove for a while along sandy roads strewn with plastic bags. On the horizon, he could see gas flares from the oil refineries, pillars of amber flame rising into the sky. As he approached Basra, the largest city in the province, desert scrub gave way to empty apartment blocks and rows of withered palms. Though the sun had barely risen, the temperature was already nearing 100 degrees Fahrenheit. The previous year, Basra had registered one of the highest temperatures ever reliably recorded on earth: about 129 degrees, hot enough to cause birds to drop from the sky. Ghazi, a sixty-two-year-old with stooped shoulders, an ash-gray beard, and lively brown eyes, would have preferred to stay home and wait out the heat. But he hadn’t had much of a choice. He was the president of the local council of Mandaeans, members of a gnostic religion that appeared in Mesopotamia in the early centuries ad. Today marked the beginning of their new year, and Ghazi, who was born into the Mandaean priestly class, was responsible for making sure everything went smoothly: he needed to find a tent to shield worshippers from the sun and, most importantly, a location near flowing water where they could carry out the ceremony. Mandaean holidays are celebrated with a mass baptism, a ritual that is deeply rooted in their scripture and theology. Mandaeans follow the teachings of Yahia Yuhana, known to Christians as John the Baptist. Water is central to their religion. They believe that all life originates in the World of Light, a spiritual realm that is the starting point for a great river known as Yardana, or Jordan. Outside the World of Light lie the lifeless, stagnant waters of the World of Darkness. According to one version of the Mandaean creation myth, a demiurge named Ptahil set out to shape a new world from the World of Darkness, which became the material world we inhabit today. Once the world was complete, Ptahil sculpted Adam, the first man, from the same dark waters as the earth, but his soul came from the World of Light. In Mandaean scripture, rivers are manifestations of the World of Light, coursing from the heavenly Jordan to the earth to purify it. To be baptized is to be immersed in this divine realm. For two millennia, the abundance of rivers and marshes in southern Iraq made flowing water easy to find. Even when Ghazi was growing up, in the Sixties, the water from the canal near the local mandi, the Mandaean temple, was fresh and clean enough to drink. Ghazi remembered the ceremonies in those days drawing thousands of worshippers. But in recent years, climate change, wasteful irrigation, and an escalating regional conflict over access to water have steadily reduced the number of places where the Mandaeans can worship. Now the mandi was surrounded by blast walls, and the canal was a brackish trickle, choked with trash and smelling like a neglected latrine. Ghazi turned onto one of Basra’s dusty streets and parked beside the mandi. He stepped into the mounting heat and hurried inside to collect the items he needed. Ghazi expected only about a few dozen people to attend the ceremony; there were once tens of thousands of Mandaeans spread across southern Iraq and Iran, but their numbers had been whittled down by decades of war, economic crisis, and drought. No more than two thousand Mandaeans now live in Basra—about a tenth of the number during Ghazi’s youth. For those who did remain, Ghazi had become something of a centripetal force. He was one of the dwindling few who could be counted on to practice the old traditions and make sure others could, too. Keeping the faith could be a comfort, even if many Mandaeans had accepted that they had little future in their homeland. The direst climate forecasts were now predicting that, within a generation or two, the land where civilization began could struggle to support human life. Ghazi was born in 1955 in Basra’s Jumhuriya district, an area with vast networks of canals that earned the city the nickname Venice of the East. As a boy, he often walked along the banks of the Shatt al Arab, the great river formed by the confluence of the Tigris and the Euphrates that cuts through the center of Basra. He watched fish dart beneath the surface, flocks of migratory birds darken the skies, and honeymooners pace the corniche. Basra’s canals watered groves of mangoes, apricots, lemons, apples, bananas, and millions of date palms—the region was reputedly home to a fifth of the world’s total. After school, Ghazi and his friends wandered through the orchards and plucked fruit from the trees while they studied. “No one ever told you not to eat them,” he said. In the Seventies, though, as Ghazi was entering adulthood, Iraq went through a period of rapid change. The recently empowered Baath Party, an Arab-nationalist group, initiated a Soviet-style project of economic reform, setting up vast irrigation projects and dams to transform Iraq into a regional power. Successive presidents expanded the bureaucracy and the military to oversee these efforts, and many young Mandaeans decided to take jobs with the government rather than train to be goldsmiths, the community’s traditional profession. Ghazi’s three sisters became teachers, his brother worked as an engineer, and he joined the Air Defense Forces, where he eventually rose to the rank of captain. When Saddam Hussein invaded Iran in 1980, Basra, barely ten miles from the border, was turned into a war zone. Date groves were bulldozed to make way for military bases and artillery positions. Over eight years, hundreds of thousands of people were killed in bombing campaigns, chemical attacks, and trench warfare reminiscent of the First World War. Young Mandaean men were conscripted and sent across the country to fight. Wealthier families began to leave, heading to Europe, Turkey, or the oil-rich Gulf states, while those who stayed carried on as best they could between rounds of Iranian shelling. In the Nineties, Saddam almost entirely drained the marshes north of Basra to root out insurgents—an act of environmental vandalism sometimes considered as significant as the deforestation of the Amazon. As Basra’s infrastructure degraded, contaminated water began to flow into the canal beside the mandi and the baptisms there ceased. “There was sewage, filth, trash,” Ghazi said. By the time the United States invaded Iraq in 2003, Basra was a ghost of its former self, devastated by two decades of war, sanctions, and neglect. When the occupying forces dissolved the Iraqi military, Ghazi left the Air Defense Forces and did not return. He had enough to think about just trying to keep his family safe. As a small minority, Mandaeans have often been subject to misunderstandings about their beliefs, and this has led to persecution at various points throughout their history. They enjoyed relative protection under Saddam’s secular police state, but after the US occupation they were targeted by radical Islamist factions as well as by criminals who took notice of their reputation as goldsmiths. Several Mandaeans I spoke with had stories about being robbed or harassed at checkpoints because guards thought they might be carrying gold. While the post-invasion Iraqi state has not officially marginalized or persecuted the Mandaeans, its sectarian political structure has left them with little influence and little access to the few resources the state can still offer—a situation common to many Iraqi minorities. In 2004, Ghazi fled with his wife and seven children to Jordan, but they returned to Iraq when he was denied asylum. Several years later, Ghazi decided to go to Sweden, planning to bring the rest of his family later. He flew to Stockholm on a tourist visa, and when it expired he simply stayed, living with cousins who had moved there earlier. He hated to be apart from his family, but felt it was necessary to establish a foothold outside Iraq. In Sweden, Ghazi tried his best to practice his faith, although his new environs were not always well suited to the rituals. He arrived in Stockholm during Panja, a Mandaean spring festival that takes place when mountain snowmelt swells the Tigris and Euphrates. In Sweden, the temperature was close to freezing and there was still snow on the ground. Ghazi was baptized anyway, along with a few dozen others, in a small, tree-lined lake in Fittja, a suburb known for its large immigrant population. “It was cold,” Ghazi said, “but if you wanted to be baptized, you had to bear it.” He told me that some Mandaean communities had been able to adapt to cold weather by building mandis with pools that circulated warm water. What really unsettled him, though, was how far the younger Mandaeans seemed to drift from their faith once they were immersed in Western culture. Many, he knew, would never return to Iraq. When he returned, Ghazi was struck once again by how much Basra had changed. 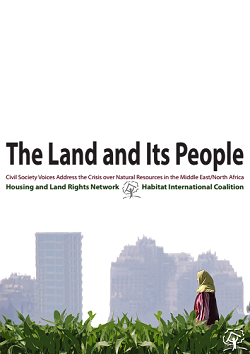 Squatters, many of them farmers or herders fleeing the drought-stricken countryside, had packed into mud-brick and concrete shacks along the coasts or vast slums in the desert. The heat, which had always been severe, had grown steadily worse, and once-rare dust storms had become a regular occurrence. Even Basra’s prized barhi dates, which tasted like butterscotch and grew on short, squat trees, were now mostly imported from abroad. Ghazi still could not ensure the safety of his family, but he felt calmer because they were together. The Mandaeans continued to practice their religion during the war, although it became harder as their numbers dwindled. Safety concerns began to dictate where they could hold their ceremonies; sometimes they practiced in Ghazi’s friend’s orchard south of the city, sometimes in a small pool at the mandi. A few years after returning to Iraq, Ghazi was elected to the community council and then appointed its president. One of his first tasks was to find a new place for the Mandaeans to worship. Last year, he bought a plot of land by the Shatt al Arab, a strip about twice the length of a tennis court in the shade of a massive suspension bridge being erected by an Italian company. But problems emerged almost immediately. As a Mandaean, Ghazi had few connections in government—no relatives or friends in positions of power—and he soon found that the necessary building permits were not forthcoming. Iraq faces a devastating environmental outlook. Climate change has led to a decline in precipitation in the mountainous regions that feed the Tigris and Euphrates. A severe drought in the Aughts caused the rivers’ basins to lose some 144 cubic kilometers of stored water—roughly the volume of the Dead Sea. They have never returned to their former sizes. Nearly every reputable climate model predicts that such droughts will become more frequent in the coming years. A 2015 study published in Nature Climate Change used “wet-bulb temperatures”—a combined measure of heat and humidity—to predict that parts of the Persian Gulf could see temperatures that imperil human survival by the end of the century. The following year, a study by the Max Planck Institute for Chemistry forecast that extreme heat, dust storms, and air pollution could render some parts of the Middle East “uninhabitable” within decades. These environmental shifts have been exacerbated by decades of mismanagement and cutthroat regional politics—in particular, a long-running competition for water between Turkey, Iran, Syria, and Iraq. While Syria has been unable to embark on new infrastructure projects since its civil war started in 2011, Iran has completed or begun work on nine dams along tributaries of the Shatt al Arab. Turkey has pushed forward with its Southeastern Anatolia Project, a program to develop twenty-two dams along the Tigris and Euphrates basins that has aggravated Iraqi authorities since its conception in the Seventies. (In 1990, Saddam threatened to bomb Turkey’s Atatürk Dam on the Euphrates, which had just come online, but backed down after Turkey mobilized its military and threatened to block water flows into Iraq and Syria entirely.) The mammoth Ilisu Dam, which opened this year in southeastern Turkey, is expected to cut the Tigris’s flow in half while it fills. Meanwhile, Iraq has struggled to move beyond a Baath-era system of water distribution that privileges the country’s north. Granting greater shares of water to wealthy constituencies and strongmen in order to curry favor has been a feature of Iraqi politics at least since Ottoman times, and this long history has made such practices hard to reform. When I spoke to Iraq’s minister for water resources, Hassan al-Janabi, who has tried to limit each region to its allotted share, he told me that local officials call him constantly to lobby for extra water ahead of the rice-growing season. Nature Iraq, an NGO founded in 2003, has been trying to delay the effects of climate change by reflooding the marshes that Saddam had emptied. Conservationists from Nature Iraq used the name Eden Again for their efforts to break down Saddam’s old embankments, a reference to scholarly speculation that the biblical garden might have been located in southern Iraq. Today, the group helps Marsh Arabs adapt to climate change, but even its most optimistic members admit that the region’s environmental prospects are bleak. Jassim al-Asadi, the organization’s director in southern Iraq, told me it was unlikely that more than 2,500 of the former 20,000 square kilometers of marshland could be salvaged in the long term. Like Marsh Arab culture, Mandaeanism is a living link to Mesopotamia’s ancient past, a set of traditions rooted in the region’s historical abundance of water. Mandaean religious leaders, known as tarmidas, are required to drink directly from rivers and springs and to avoid water sent through pipes or stored in plastic containers. Today, Basra’s water is so salty that the one remaining tarmida, a forty-year-old man named Mazin, must drive some two hours north to find water pure enough to drink. One Mandaean doctor at the main hospital in Basra said that a few years back, he’d had to treat Mazin for enteric fever. “Multiple times, I told him to try boiling. He didn’t accept it,” he said. He told me that now he might see a hundred cases of gastroenteritis each week, most of which were caused by polluted tap water or contaminated ice at food stalls. When I asked what would happen if I drank from the canal outside the mandi, as Ghazi often had in his youth, the doctor laughed. “You would die,” he said. After his stop at the mandi, Ghazi drove with his wife and his son Ram to Sinbad Island, a narrow strip of land in the Shatt al Arab named for the mythical Abbasid-era sailor who was said to have set sail from Basra’s port. Ghazi had secured an agreement with local authorities to carry out the New Year ceremony on the island, with the understanding that the arrangement was only temporary. In the Seventies, Sinbad Island was a tourist destination adorned with parks, fountains, and resort hotels, but now it was covered with scrapyards, squatter settlements, and the husks of bombed-out buildings. Mazin pulled up at the wheel of a black SUV, dressed in full white robes and a turban, and parked beside Ghazi outside a rusty gate just off the highway ramp. After a few minutes spent negotiating with a police officer, who grumbled that he hadn’t been informed the Mandaeans would be coming, the men pried open the gate and drove down a rutted path to a dirt lot at the island’s southern tip. Ghazi changed into his robes as Mazin waded into the water to begin his first ritual washing. “The water’s beautiful today,” he called out. Ghazi was already distracted, though, wondering how they would keep cool with nothing but a nylon tent to shield them. (A nearby lamppost that might have provided power for a portable air-conditioning unit had been stripped of its wiring.) If the new mandi had been ready, they wouldn’t have been so exposed. But the negotiations over the building permit were going badly. Ghazi had recently gone with Mazin to see the local district chief to try to resolve the zoning issues, and the encounter had ended in an argument. Mazin lost his temper, and the official warned him, “Be careful, or next time we’ll meet before a judge.” Now it was unclear what could break the impasse. Ghazi was hoping that sympathetic officials from the US Consulate would intervene on their behalf, and he had been trying to get a meeting with the consul for months, twice inviting him to dinner, but the diplomat had canceled both times. The last time, Ghazi was so frustrated that he asked to be reimbursed for the food he’d prepared. As the sun rose, more Mandaeans began to arrive, spilling out of sedans and SUVs and changing into their robes. The women strung up a sheet between two cars to provide shelter from the sun. In the past, when the community had multiple tarmidas, the women had been baptized at the same time as the men, in a separate group, but with only one tarmida left in Basra, they now had to wait. Resting in the shade, Ghazi chatted with Karim, a goldsmith who had recently returned from a trip to Sweden, reminiscing fondly about his time there. Even the seawater there, he joked, was sweeter than the Shatt al Arab these days. Nearby, Ram and Mazin used two wooden poles to set up a white ceremonial banner known as a drabsa, and then headed down to the river with the men, about twenty in total. As each man waded into the river, Mazin splashed his face, led him forward by the hand, dunked his head three times, scooped a small bit of water into his mouth, and then tucked a branch of myrtle into his headdress. Once finished, the men returned to the dirt lot and took seats on bits of wood and battered stools, some holding their heads in their hands to shield themselves from the heat. After everyone had been baptized, Mazin came ashore and began reciting a set of prayers. He was soon interrupted by the ringing of Ghazi’s phone. Ram, standing to the side, handed the phone to his father—it was the American Consulate. Ghazi hurriedly took the phone as the other men called to him impatiently. He ignored them; he wasn’t about to pass up the opportunity for a meeting that might yield progress on the building permit. Without a new mandi, he knew, the Mandaeans would have to continue like this indefinitely, bouncing from one location to another, until one day there would be nowhere left in Basra to practice the rituals at all. After a few minutes, he handed the phone back to Ram. Mazin, visibly annoyed at the interruption, continued the ceremony, but Ghazi had gotten what he’d wanted: a consulate official would visit the mandi later that week. After the New Year, there is a thirty-six-hour period during which Mandaeans must remain at home while their protective spirits, known as utras, journey to the World of Light. On the following day, the men of Basra’s Mandaean community usually gather at the mandi to greet one another and discuss their plans for the coming months. Last year, this was also the day the political officer from the American Consulate had arranged to come by for a meeting. Ghazi arrived at the mandi early, dressed in a brown sport jacket and blue button-down shirt, his shoes immaculately shined and his hair slicked back behind his ears. Men crowded into the reception hall, embracing him and kissing his cheeks as they entered. Ghazi welcomed Dhiaa, the gastroenterologist from the local hospital, and Riad, a police officer who often stood guard outside the mandi. Mazin took a seat near the front of the room, between two enormous air-conditioning units and a shrine displaying the drabsa. As Ghazi greeted the men, a blond woman in a gray pantsuit entered the room, flanked by half a dozen stocky guards wearing polo shirts and baseball caps, wires dangling from their earpiece radios. The officer had arrived. After plying her with bottled water and a tray of dates, Ghazi led the visitors upstairs to his office. For months, I heard nothing from Ghazi. Then, early this year, his half-decade of advocacy resulted in a breakthrough: the community was given permission to build. When I spoke to him by phone in March, he sounded tired, but he was excited to send me pictures of new concrete pathways, corrugated metal awnings, the beginnings of a small office, and a freshly tiled bathroom. But the progress had done nothing to brighten his mood about the Mandaeans’ future in Basra. He told me that, just the previous week, a Mandaean and a Christian had been killed, one more in the grim chain of attacks that was slowly driving both groups out of Iraq. “There’s no hope for a better future for Iraq,” he told me. It was hard not to share his gloom. In the coming decades, Iraq’s political crises are likely to be exacerbated by the changing climate. And even if the governing class did somehow manage to overcome their myriad disputes and confront the water crisis, much would still lie outside the state’s control. An enormous amount depends, for instance, on Turkey and Iran curbing the dam-building programs they see as vital to securing their own water resources, as well as on major polluters such as the United States cutting back their carbon emissions. As with the sinking floodplains of Bangladesh, the expanding deserts of the Sahel, and the hurricane-stricken islands of the Caribbean, climate change in Iraq disproportionately afflicts the poor and marginalized, while its potential solutions depend overwhelmingly on the rich and powerful. 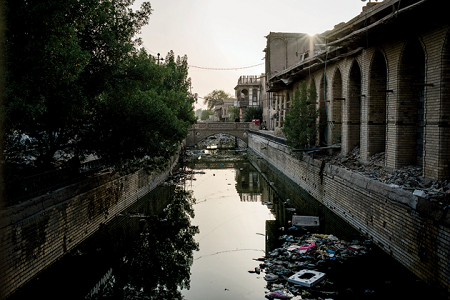 Photo: A polluted canal in the old city. Photo from Basra, Iraq, July 2017. Source: Alex Potter.